Jojo Moyes's bestseller, Me Before You, catapulted her to wide critical acclaim and has struck a chord with readers everywhere. "Hopelessly and hopefully romantic" (Chicago Tribune), Moyes returns with another irresistible heartbreaker that asks, "Whatever happened to the girl you left behind?" France, 1916: Artist Edouard Lefevre leaves his young wife, Sophie, to fight at the front. When their small town falls to the Germans in the midst of World War I, Edouard's portrait of Sophie draws the eye of the new Kommandant. As the officer's dangerous obsession deepens, Sophie will risk everything—her family, her reputation, and her life—to see her husband again. Almost a century later, Sophie's portrait is given to Liv Halston by her young husband shortly before his sudden death. A chance encounter reveals the painting's true worth, and a battle begins for who its legitimate owner is—putting Liv's belief in what is right to the ultimate test. 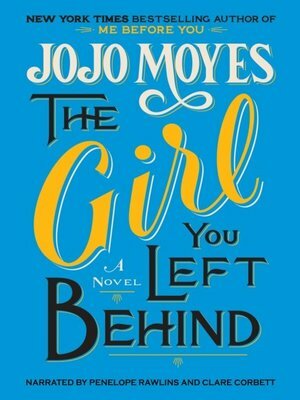 Like Sarah Blake's The Postmistress and Tatiana de Rosnay's Sarah's Key, The Girl You Left Behind is a breathtaking story of love, loss, and sacrifice told with Moyes's signature ability to capture our hearts with every turn of the page.